Summer produce candy is here, and today it’s taking the form of this super easy, super flavorful melon salad. 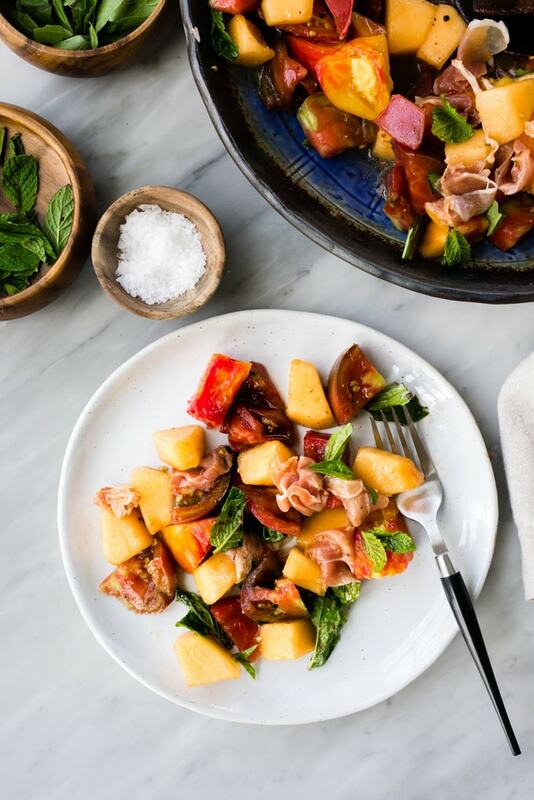 This simple recipe is made with diced cantaloupe, heirloom tomatoes, mint, and basil and tossed with an apple cider vinaigrette. It’s naturally paleo and gluten free, ready in just 15 minutes, and popping with all of the best flavors of summer. We’ve reached the height of summer produce availability and my taste buds (and meal planning schedule) couldn’t be happier. Day after day I find myself reaching for simple summer salads that come together in mere minutes and I leave my kitchen feeling like a super hero. 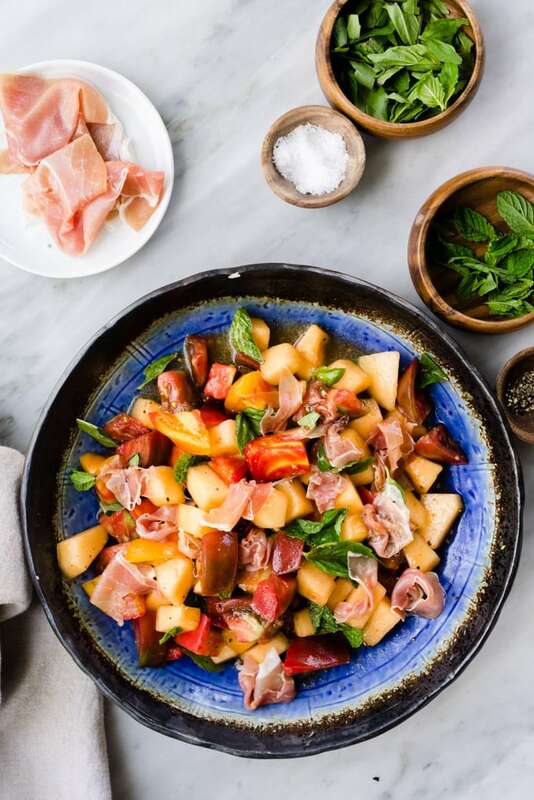 Simple foods can be the best foods, and this melon salad with prosciutto and tomato is all the evidence I need to back that claim up, and back it up good. Honestly, if you’re not eating all of the melon and all of the tomatoes right now, you’re doing it wrong. 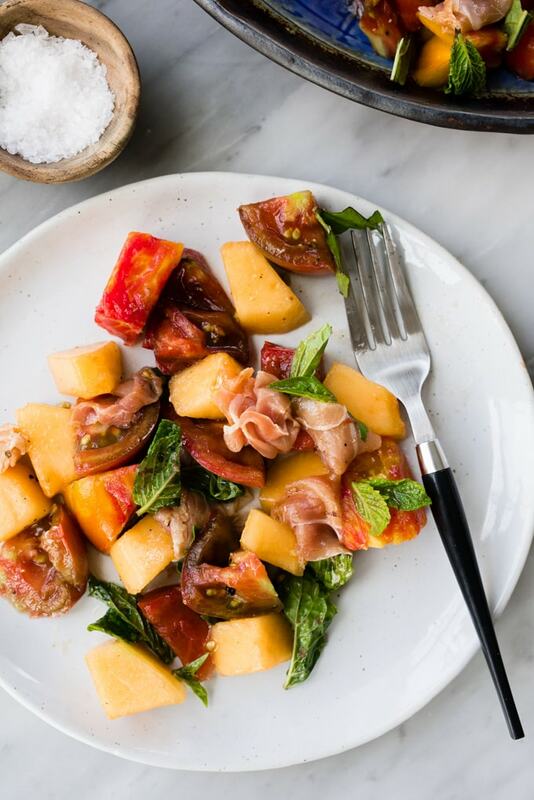 Get yourself right with this delicious combo of juicy cantaloupes and tomatoes, salty prosciutto, and bright and fresh mint and basil. You’re welcome. Pin it now! Click here to save this Melon Salad to your Summer Recipes Board on Pinterest. 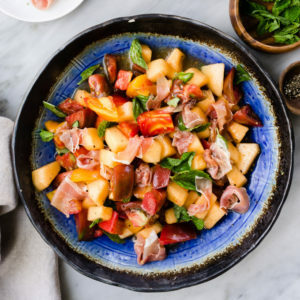 With simple recipes like this melon salad, the raw ingredients take center stage, so buy the best you can get your hands on. It’s worth seeking locally sourced produce that’s perfectly ripe. I used cantaloupe here, but any kind of melon is going to work. Try watermelon or honeydew, or other more unique varietals offered at your farmer’s market or local co-op. Juicy, vine ripened tomatoes are boss. You can’t beat heirloom varietals, with their concentrated, sweet flavors. 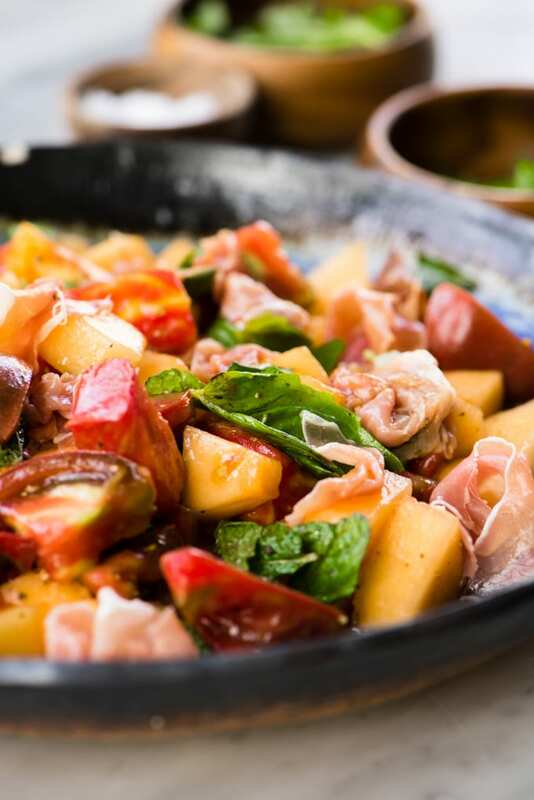 While you’re shopping, grab some good, high quality prosciutto (you only need a little), and the freshest, most fragrant mint and basil on offer. Step one: obtain juicy, delicious produce. Step two: dice ’em, toss ’em, salt ’em. That last bit is important. Salting the melon and tomato will cause the fruits to release some of their juices. They’ll be more intensely flavored, and the resulting run off juices makes a tasty contribution to the dressing. After they’ve macerated for a bit (just a few minutes), toss in the prosciutto, mint, and basil. Tear the prosciutto into bite sized pieces, no need to be precise. Samesies with the herbs. Some of the leaves may already be bite sized, so go ahead and throw those in whole. And now we dress with this zippy dressing of apple cider vinegar, extra virgin olive oil, and a dash of honey. It’s the perfect complement-not-compete blend. Give it all a good toss, and then eat immediately. 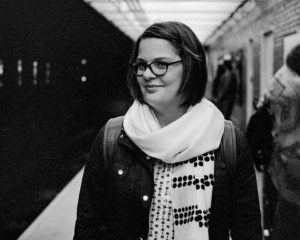 Consider sharing (it’s the nice thing to do), but I wouldn’t blame you if you kept it all to yourself. This is a judgment free zone. This salad is perfectly balanced with just the right amounts of sweet/salty/acid happening, and I just can’t get enough. 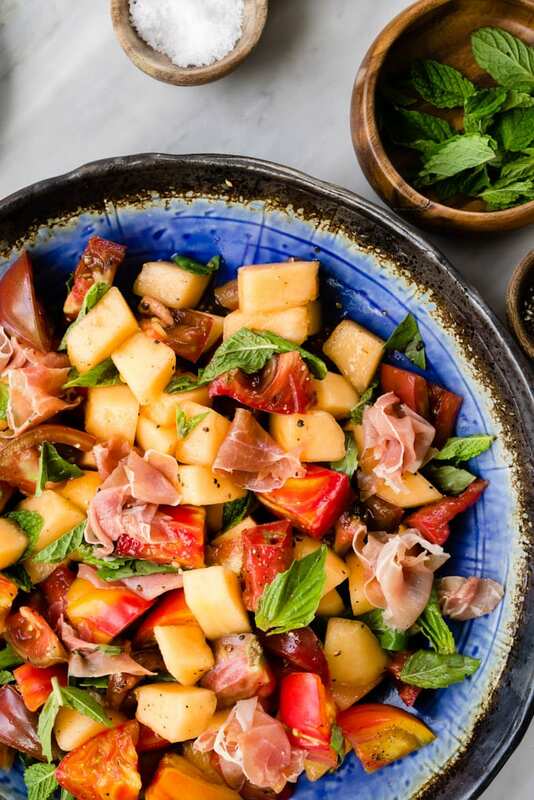 DID YOU MAKE THIS MELON SALAD WITH PROSCIUTTO AND FRESH HERBS? I WANT TO SEE YOUR CREATIONS! SNAP A PICTURE AND SHARE IT HERE ON PINTEREST. 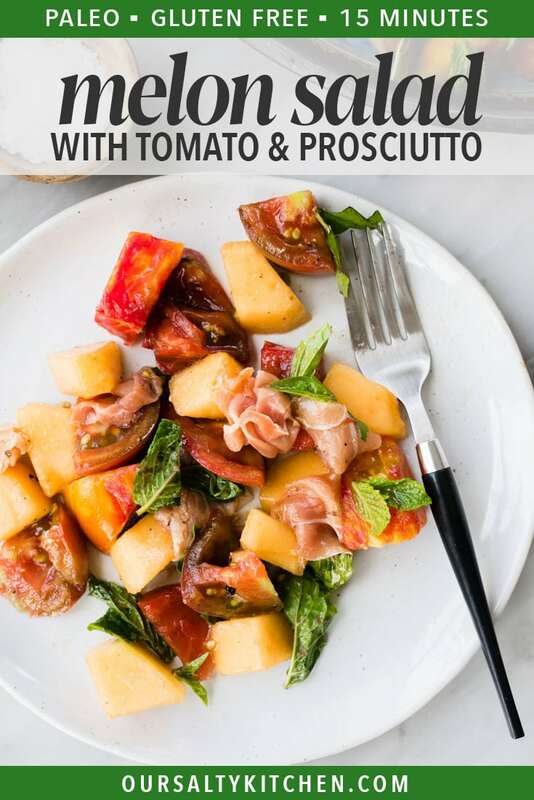 This simple melon salad with prosciutto, tomato, mint and basil is naturally paleo and gluten free and ready in just 15 minutes! A perfect summer side dish. Toss the diced cantaloupe and tomatoes in a salad bowl. Sprinkle with sea salt and set aside to macerate for 5 minutes. Add the prosciutto, mint leaves, and basil leaves to the salad. Whisk the apple cider vinegar and honey in a small bowl, then slowly pour in the extra virgin olive oil, whisking vigorously until emulsified. 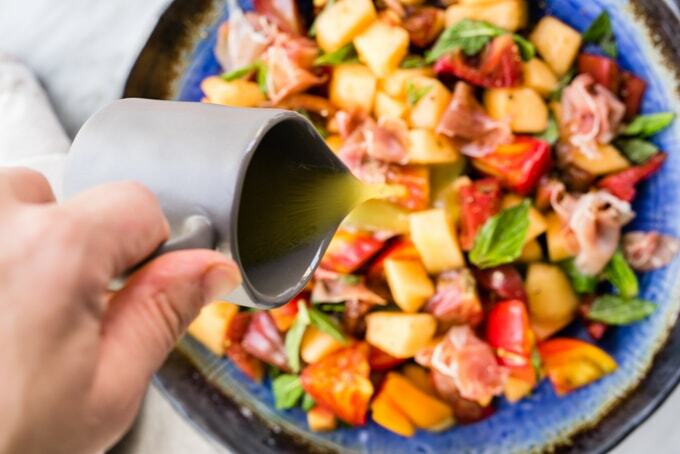 Pour the vinaigrette over the melon salad and toss. Sprinkle with cracked black pepper to taste, and serve immediately.